You can't own nothing. People have tried. There were those rare members of the esteemed species Humanity, that looked not at the stars but the black spaces in between and lusted to have seen all they could offer. These people, who were usually called Travelers by those who liked to keep their adventures terrestrial, conquered space in the early years of accessible flight. They went forward to take what the could from what no one else had been able to face. The Nothing. The Nothing was the name that Travelers gave to the emptiness of space. They said it with a longing and a wistfulness that gave the words more of a fantastical meaning than the traditional empty one. Travelers would always have the same look in their eyes, nevermind the species, race or religion, they would look hungry. These were people who were meant to seek danger and defeat mystery. Humanity, "humans" having become something of a dated and inaccurate term due to the many paths of evolution they eventually traversed down, was the premier species in what had become something of a lawless Universe. Anything that would have earlier been described as "humanoid" fell into the category. Whether you had fur or scales or four arms as long as you were descended from the original species of the home planet Earth you were grouped into the same race. Hence species became a much more important factor for determination of who was what. The Eternity Corporation has, of late, been taking a shot at controlling the Nothing. Stations appeared, floating where before there were only asteroids or deposits of the stuff of the universe humanity had long since used to harness. The EC did have a bit of a penchant for enforcing their ideals, which of course led to quite a bit of violence. Years of semi-war passed. Force-fields were erected, sides chosen. And eventually there became only two real locations life in the Universe. Centralized Space and the Nothing. The EC had set itself up as something like a despotic government, having become the only people able to supply civilians with goods. Travelers because Outsiders. People who fought against or in anyway undermined The EC. While there were still Travelers, folk who simply wanted to see all there was for a humanity to see, most would be branded as Outsiders eventually by one slight or another. This will be the story of one such group. Travelers forced into Outsider status by faulty charges levied against them for the competition they provided in selling goods to civilians. A once merchant ships suddenly thrust into the violent world of the Nothing. With no Centralized Space to return to their ships became their home. The Intrepid, an old but reliable ship, floats in the Nothing with a small crew of disheartened men and women. The crew will have to adapt of course. And we wish them the best of luck. I need some clarification on exactly what the Nothing is, so it'd be good to this asked and answered publicly. People see the Nothing so wistfully I must think them all insane, unless of course they see something valuable in what could just be 'empty' space. Do they seek the voids between worlds, stars and galaxies so as to maximally tap into some ethereal thing like vacuum energy? Or do they want to control the space as one would a border or a highway, using it to direct travel and elicit payment from people wishing to travel through such a space? Also some clarification on scale would be nice, to know what sort of space we have in which to move around. Interplanetary? Interstellar? Intergalactic? Ah, yeah. I can see how that may cause issues. The Nothing is just what people who adventure about call space. It's just a fancy way that they say "all that space"
EDIT: But yes they sort of managed harness the stuff of space too in this universe. Appearance: Zeff stands with a straight military stance; shoulders back, chin high, eyes piercing. He has a somewhat calm demeanor that matches his always stoic facial expression. He has a thick chest and broad shoulders and stands at a good six feet and change. He has a blonde beard that hasn’t seen a razor in a while. His hair is somewhat dirty and longer than he would like and his eyes are that of a dark brown. His clothes are fairly drab consisting of dark brown pants and a grey, dirty, shirt. The shirt's sleeves are ripped and reveals a left arm entirely made of metal and a right hand similarly garnished. History: Zeff served in the EC military for a number of years. He was a fairly highly ranked officer, topping off as a colonel, but after his second five year term, he dispatched himself from his military duties. The military life wasn’t for him, he didn’t enjoy the strictness of it, the harshness of battles, the atrocities of humanity. In the years proceeding, he drifted from rock to rock; black-market to black-market, piece by piece replacing parts of his body with that of machine. He had picked up the idea of running a merchant ship after he had served under a commander for ten plus years; He had missed the aspect of going where he wanted, when he wanted. He found this in The Intrepid, and would take those who offered. He started out small, but garnered some of the wrong kind of attention. Eventually, he found himself branded an Outsider and that was that. Species: Iff'Lad; Larger than normal Humanity subspecies, usually reaching about nine feet in height, sometimes up to eleven. Thick, rhino-like skin that provides preposterous durability. Typically viewed as dumb though they are a species of average intellect. Age either quickly or slowly depending on the amount of injury they sustain. An Iff'lad has ten "lives" outwardly aging a decade each time they are forced to restart their heart. As such "child soldiers" are not an uncommon idea among them. Agile when younger and smaller, as they ascend in number of lives they become larger and slower (in the case of males). A female Iff'Lad is a warrior, just the same, but with a focus on stealth and agility. They evolve to become lithe and in later lives brittle. Their skin is not as thick as they are not meant to be touched. Upon death they grow still and fossilize on the spot. There are two kind of Iff'Lad, the Grey who become stone and have grey skin and the Blue who become crystal. History: Cragg was born on the Iff'Lad home planet Stark. Upon birth he was taken into the military training program and fought in the international war that has been plaguing Stark for as long as the planet has held them. He, being a Grey, spent his early life locked in combat with his Blue counterparts. After serving his mandatory first life in the military he grew substantially, learning that he was going to grow unusually large he was highly sought after by Sports and Military agents. He spent a few of his subsequent lives in the military, as an activist and minor league player of sports. When the thought to explore occurred to him he sought out employment by a ship captain that he could perhaps actually respect. He settled on Captain Darien. Shift: Being a hybrid, he can shift between the choice of his race. 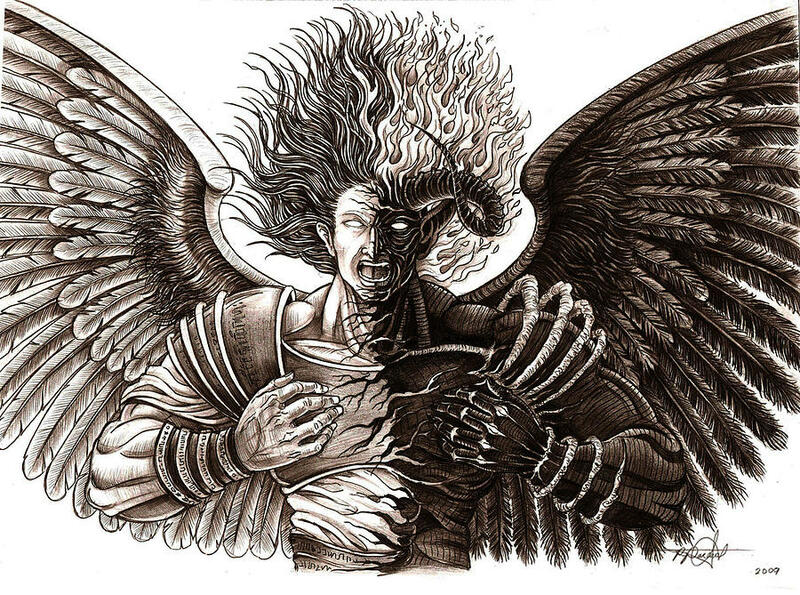 Whether that be Full-Angel, Full-Demon, or Full-both. Spiritual Expression: Being a spiritual being he is considered an infant and hasn't awoken to his full potential. This ability allows him to express his spiritual presence on this plane and the spiritual one. He can also make the shape of different objects with his spiritual energy, but can't actually manifest his energy into complete physical objects. This is a technique passed to royal winged beings. Swordplay: His choice of defense. In truth they are just handles that sit on his waist, but when he exerts his energy through them they become blades. The length of the blade determines on the energy exerted. Blanco is a product of 2 rebel spirits deciding that they would test the bounds of their nature. His parents where 2 separate races of winged beings which found each other through astral projection. They had not met each other before then, and eventually became intimate with each other in spirit. They finally met and discovered that they where both royal members of rivaling species. A younger sister princess from the Divine Society, or Disot, and a dethroned king from the Sky of Flames Association, known as Soflaas. Both where trying to fight for their right to the throne. Their first meeting was highly tense. Yet serene and immeasurably beautiful. The flames of animosity they had both held for each others clan had transformed into flames of love. The 2 lovers continued to hide their love in the spiritual realm. Upon losing most hope for gaining their spots to the throne, they came up with an idea that would change the tides of their race. By conceiving their child in the spiritual world, he would be a pure spiritual being unlike the rest of their race, consequently holding the future of whether the two clans could stop the civil war between their species, and stop the civil wars between their clans. He was supposed to be the Ray of hope that brought them to the throne of a new clan, and at first... He was. Upon the recognition of his mothers pregnancy, her royal family became more spiritually involved. Seeing how everything is connected and much more vibrant in the spiritual world, they began to perform the normal ceremonies that occur when a royal member is pregnant, but when they asked for the father and a Soflaa appeared, they originally rebuked the couple as treasonous. The Soflaa had lost their spiritual knowledge and could not perform the ceremony there, but upon the Royal Disots listening to the wisdom of the All-Creator, they became open to the idea of a hybrid child. The ceremony was performed, and the child was harbored in the Disot community. Blanco could not be shown to the public for decades, due to his red eyes inherited from his father. Unfortunately, he also inherited a disconnection to the spirit world. His father and mother continued to meet and plot their rise, while he remained an oblivious pawn. His only pleasures were his time with his mom, Disot grandfather, and gazing into the starry skies... Wondering where and when he would be able to see his father. This spawned his affection of The Nothing. Blanco became enraged at the oh so common words of one of his house keepers... The master does not belong here. Everyone can sense it. He wreaks of Soflaa descent. He forcefully received the location of the Soflaa Sky island from the keeper and brutally left in search of his father. With nothing but the picture sketched in his head from his mothers words, he would hunt. Upon arrival to the island he stormed through the castle and did not find his dad. Instead he was imprisoned and eventually broken out by rebels. His father greeted him and they began a father son connection.This is also where he obtained the nick name Blade. His father taught him the arts of swordsmanship, showed him the power of energy manifestation, and even taught him some secret Soflaa recipes that could make any cook bow to your prowess. His father finally decided that he should know what his purpose was, and Blanco agreed. To him he would get the chance to slaughter the ones that imprisoned him, and the ones that looked down on him as some peasant. He planned the approach with his father, prepared for the coming battle, and smiled... Because Blanco couldn't be any happier. His mother enticed a war between the clans. She said that her son was actually kidnapped. Upon the day of the war she stayed at the palace, while Blanco and his father where arriving. As the war raged on the Sky Plains of Effervescence, Blanco and his father crashed into the plains and presented their proposition. The people of both sides where so filled with hate they didn't even consider it, and his father gave Blanco permission to use a power that was shown to him specifically for this day. Blanco shifted between his full Angel and Demon forms, targeting the species of his current form, and showing them his might was strongest. Eventually the two clans banded together for one cause, and his father commanded him to stop, but Blanco had lost himself in between shifting forms and Shifted into the true hybrid being that he was, causing an unstable burst in spiritual energy and a crater nice hole in the island. The fear from witnessing such power ended the war. Blanco and his parents endeavors had become known as the Dawn of Dusk massacre. Blanco was deemed the Emperor of the newly made clan, known as The Guild of Sky's Fury. He was taught how to do astral projection and control his Shifting abilities with the Divine Society clan by day, and was training his Energy Manisfestation and swordplay with his dad by night. His parents had other plans in mind though. Blanco became spiritually prominent, and discovered the intentions of his parents. They would poison him to gain the throne, and rid the world of their abomination. Instead Blanco embraced his parents and gave them the throne, as he didn't truly care for it. His interest was past the stars. Halting his studies in all areas, Blanco then became a shadow of the clan, living amongst humans beneath them using the alias Blade Destro, the Zeal Spirit. Working as a sword for hire on weekdays, and a chef of his own restaurant on weekends. His royal positioning is what landed him such an accommodating position on The Intrepid.